SKU: CE293311 Categories: Red & Green Christmas, St Patricks Day, Green, Bunting Flags, Disco, Garden, Jungle / Safari, Ladybug, Rainbow, Science, Teddy Bears Picnic, Woodland, Big Bang Theory, Lemons & Limes, Soft Green, ON SALE! The lovely Polkadot Bunting Flags ~ Orange are a great decorating option. It is made from thick card so you can use it over and over and it will still look great; or use it to decorate a nursery or play space after the party. 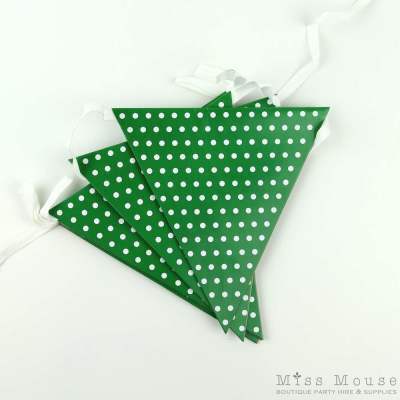 Dark green with small white polkadots. Pack size: 1 bunting, 1.8 ft long.